Proper cleaning supplies help you maintain required sanitation, and make your guests feel safe and welcome. For everything from general cleaning to degreasers, get the chemicals you need in the proper quantity to keep your establishment ship shape. Buckets, mops, and mop wringers are the key to clean floors. Buckets come in different sizes, and colors for distinguishing intended cleaning puposes. Wet mops and dry mops both help keep floors clear of debris. 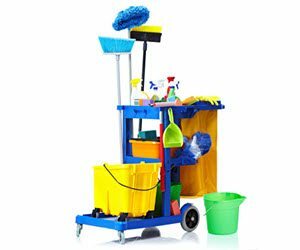 Wet mop wringer buckets have easy to use handles, and separate clean and dirty water compartments. Whether you are looking for a traditional C-fold towel dispenser or an automated motion sensor dispenser, your paper towels will be easily accessible, allowing your guests a pleasant experience. In the dining room, kitchen, restroom, and office, the right trash receptacle is a necessity. Available in a myriad of shapes, colors, and sizes to suit your needs. Larger cans easily be moved using a trash can dolly. Keep cigarette waste out of sight with an attractive outdoor receptacle.